Winter is right around the corner–you’re swapping out your flip flops for warm boots and trading in your sleeveless tees for long sleeved shirts and furry scarves. But preparing your wardrobe isn’t the only planning ahead you need to do, with colder temperatures on the horizon. More than likely, you know there are precautions you need to take to protect your outdoor irrigation system from freezing temperatures—the goal is to prevent frozen pipes that will eventually burst. Below is a list of preventative steps you can take to ensure you avoid the costly damages that come with a broken water pipe. If part of your irrigation system is already broken, malfunctioning or just old, Gra-Mac Irrigation In North Carolina has you covered. Not only are we your premier provider of the highest quality irrigation equipment, we also offer professional installation services to ensure your investment is installed properly and with great care. 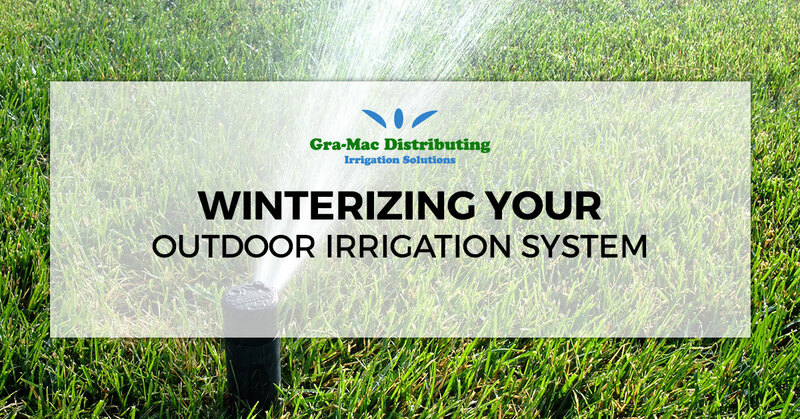 To learn more about winterizing your irrigation system, continue reading below and get in contact with our team to request a free quote, should you find yourself in need of new equipment. How does a broken water pipe occur? The minute you hear the word, “frost” in the forecast, it’s time to roll up your sleeves, put on your gloves and get to work. To begin winterizing your outdoor irrigation system, first shut off your system’s water supply. Every underground irrigation system has a main shut off—sometimes this valve is located in a basement or crawlspace, and other times, it is buried in a box underground. Many shut off valves located in one of these underground boxes require an extra long key to be turned off. In either case, the shut-off valve will turn easily to the “off” position. If your particular system uses a removable pump, remember to drain the pump, disconnect it and stash it inside until warmer weather rolls around. Any parts of your system that are above the ground need to be insulated, especially the main shut off valve. Wrap the valve with insulation, like foam insulation tape and a plastic bag, to prevent it from freezing. If there are any pipes in your irrigation system that are exposed and above ground, take care to insulate those too. Inexpensive insulators include newspaper, foam sleeves and heat tape. Foam insulating tape is also an excellent solution and can be purchased at any home supply store. The second step you want to take is draining all of the water out of your irrigation system. Without water in the system, there is nothing that expand within the pipes, causing a break. There are several different ways you can drain the pipes in your outdoor irrigation system including an automatic drain valve, a manual drain valve or a compressed air blow-out method. Manual valves: Irrigation systems with manual valves give you the ability to drain the excess water out of your system by opening a valve. Before you open any valves, make sure you have turned off the system’s water supply. You will find the manual drain valves on the piping at the ends and lowest points—simply open up all of the valves and drain the excess water. Check valves are a part of some irrigation systems and prevent water from flowing in two different directions. If your system has check valves, you will need to raise the sprinkler heads above ground to allow the water to drain out of them. Close all of the valves when the excess water has been emptied. Automatic valves: Irrigation system with automatic valves automatically drain out excess water if the pressure falls below a certain level. Turn off the supply of water to your system and run one of the sprinklers to reduce the pressure within the pipes. If your system uses check valves, you will need to drain those separately. Compressed air blow-out: Blowing out an irrigation system with compressed air is method that should typically be left up to professionals. The process involves forcing air through the irrigation system with the goal of pushing the excess water through the sprinkler heads. If you are unfamiliar with this process, contact our team to learn more. If you have blown out your irrigation system previously, just make sure you are taking the proper safety precautions to avoid harming yourself and damaging your system. If you have an automatic irrigation system, shutting down the controller is an essential step you must take to ensure the valves do not open during the winter. There are two ways you can “shut down” the timer on your irrigation system. The first method involves turning your controller to “rain mode.” This adjustment shuts off the signals to the valves without losing all of the information you have previously programmed. The controller will still keep time and maintain data like start times and valve run times throughout the winter, meaning you will not have to reprogram everything when it’s time to switch the timer back on. If, for some reason, your controller does not have a rain mode or you are looking for an alternative way to shut down your timer, simply power it off. The only downfall is that you will need to reprogram the time and all of the other settings when you are ready to turn the controller back on. Some recommend leaving the controller plugged in, as it will radiate a small amount of heat that will prevent a buildup of condensation. If you have more questions about your irrigation system or are interested in purchasing some of the highest quality irrigation equipment available, get in touch with our team of professionals today. Our irrigation systems are perfect for a multitude of uses—keep your athletic fields lush and green; use irrigation for fabrication and other services; grow healthy and fresh fruit and vegetable gardens or farmland; keep your greenhouses blooming and green; and keep your livestock cool in the warmer months. Other uses include keeping logs moisturized to prevent breaking and splitting, watering acres of trees at nurseries, keeping row crops moist, as well as maintaining residential landscaping, subsurface drip irrigation and more. We also offer premier installation services to ensure your new irrigation system is installed properly and working perfectly. Contact us today to request your free quote!